I wrote about this in my last post, but I've been having so much fun with our CSA boxes. We've done CSAs in the past but we've always wound up cancelling because we can't use everything. I'm bound and determined not to let anything go to waste this time. Radishes might have been one of the things that got tossed in the compost in the past. Never again! 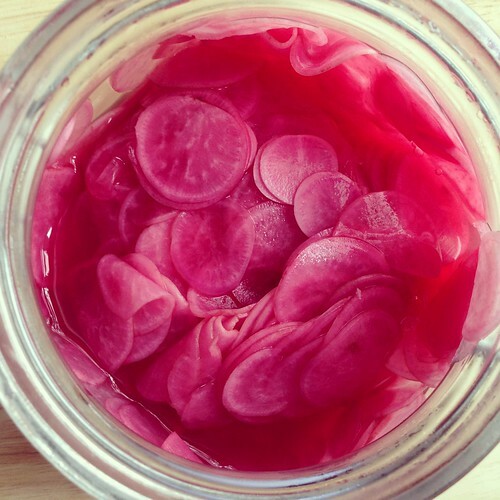 I'm addicted to these Pink Pickled Radishes. I liked them so much that I ate a whole batch before Andy got to try them, so I was compelled to make a double batch for my second try. These are great on salads, or just plain as a side dish or snack. The pickling takes the spicy bite out of the radishes and replaces it with... pickleyness. I highly recommend using a mandolin for slicing; the thinly sliced texture definitely made a difference in pickling achievement. Also, just a note that this takes a few days. They taste decent right away, but infinitely better if you have some patience! 1. Trim ends and roots of radishes, then wash and dry. Slice very thinly, preferably with a mandolin. 2. Place 1/4 of sliced radishes in jar then sprinkle with a little salt. Repeat process until all ingredients are used. 3. Sprinkle with red wine vinegar. Place lid on jar tightly then shake! Refrigerate for 3 days, shaking once a day or so.